Interested in Joining the Heirloom Restaurant Group Team? Front-of-House Position Available. The Heirloom Restaurant Group’s front-of-house staff is responsible for making our guests feel welcome, well cared for and ensuring guests return and become regulars because of the unique dining experience we create. Being able to genuinely connect with guests on a high level is a critical skill each server/host must possess. You must also have a “can do” attitude about all challenges with which you’re presented. A strong knowledge and passion for food is imperative to anyone’s success at our restaurants. Because our servers and hosts are the main line of communication with our guests, we require you to develop a thorough understanding of our menu and our local purveyors in order to create a unique experience for our guests. The high standards of our restaurants require staff with intelligence, strong reasoning and exceptional service and hospitality skills. Definition of Hospitality: The friendly and generous reception and entertainment of guests, visitors, or strangers. If we believe you have good potential to join our team, you’ll be contacted for an interview. After a successful interview, you’ll have the opportunity to demonstrate your service and hospitality skills by performing a “stage” (pronounced: st-a-gz) … which is basically an audition. You’ll perform the role of a back server for a few hours so we can see how you perform and interact with guests. A stage is an important opportunity for both you and us to see if you’re a good fit for our team. The Buzz about Mason Bees — Our Native, Local Pollinating Machine! You’ve probably heard that honey bees, a European import, aren’t doing so well. Research has failed to identify a specific problem but it’s pointing to a combination of factors and a sydrome dubbed Colony Collapse Disorder. While apiarists (honey bee keepers) are doing all they can to address the situation, a bee native to North America and common in Utah is quitely doing what it’s always done, pollinating like mad — and it’s garnering new interest for doing so. Mason bees, also referred to as the solitary bee or orchard bees, do not make hives nor do they produce honey. They are also very docile and don’t sting! But what they do do is pollinate like nobody’s business. Their pollinating activity during their short life span is simply amazing when compared to the honey bee. It takes as many as 100 honey bees to match one female Mason bee’s pollinating productivity! That’s right, the females are the work horse (shout out to all the ladies!) and they work tirelessly from sun up to sun down collecting pollen, creating nests and laying eggs during their one to two month life span. They could be the ultimate working Mom! As soon as the female Mason bee emerges in early spring, she mates — and then she gets down to business. Mason bee couple -- date night! 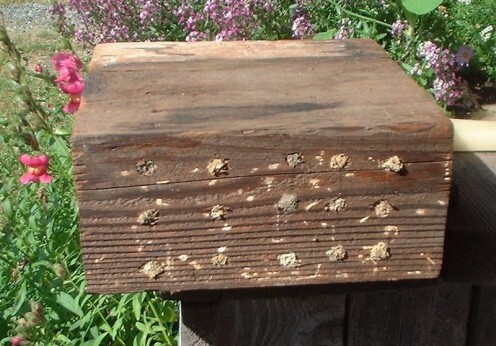 Mason bees garner their name from how the females nest … they create mud “cells” in small holes. If you have fruit trees, strawberries, raspberries, any spring blooming plans or are just interested in helping out the local enviroment, you should consider providing a place for Mason bees to nest. You can even order Mason bees from Utah from vendors like Mason Bees for Sale. You can purchase or easily make a Mason bee friendly nest and place it in your yard or in your garden. Again, the Mason bee does not sting and they’re very interesting to observe. If you put up a nest now, you may have some local Mason bees create nests … but if you’re interested, at the least you can plan to purchase some Mason bees and be all ready to go for next spring. At any rate, just google “mason bees” and you’ll find all kinds of information about this native, local blessing. If you decide to take action, we’d love to hear about your experience with and advice about Mason bees! Provo’s Farmers Market Opening Next Saturday! Each year we happily welcome back Provo’s Farmers Market, where craftsman, farmers and others from Utah County have the opportunity to share their local goodness with the general public. The 2011 Market opens next Saturday, June 4th, and runs every Saturday from 9 am – 2 pm through October 29th. Provo’s Farmers Market is located in the nice and shady Pioneer Park located at 500 W Center Street. You can be sure we’ll be around, perhaps we’ll see you there! Kick off Memorial Day Weekend with Brunch at Communal! There’s really no better way to start a long weekend than enjoying a great Saturday brunch with family and friends — so join us! Our take on the Pine State biscuit breakfast sandwich features our house made bacon, fried egg, cheese, fried chicken & gravy. Dive in! Communal eggs Benedict -- simple, rich and delicious featuring our fresh, house made Hollandaise with choice of home fries, fries or salad. Creamery in Midway Opens This Week! This past Monday, May 23, kicked off the Grand Opening Week for the Heber Valley Milk and Heber Valley Artisan Cheese Creamery created by the Grant Kohler family. Grand Opening celebrations continue through this Saturday and include prize drawings, discounts, free samples, and creamery products available for purchase. You can also check out calf petting on both Friday and Saturday this week, and on Friday they will be making cheese for anyone who would like to watch. Regular hours will be Monday – Saturday, 9 am – 9 pm. Congratulations and best wishes to the Kohlers! Fresh From the Communal Smoker — House Made Sausage! One of the many ways we pay homage to the wonderful Berkshire pigs provided to us by Christiansen Family Farm in Vernon, Utah, is with our house made sausage on the Communal lunch menu. We’re currently serving our house smoked sausage with roasted red pepper and onions and a house baked ciabatta crostini! Fantastico! Reserve online or phone 801-373-8000. Congratulations to our Friends at Amano! Once again Amano Chocolate has cleaned up in London at the 2011 Academy of Chocolate Awards. This is the second time our beloved Amano Chocolate has been honored in this prestigious competition. In 2009 Amano became the first American chocolate company to win The Academy of Chocolate’s Gold Medal for their Amano Madagascar Bar and five additional awards. Amano chocolates were awarded in five categories and the company received a sixth award for packaging. Art Pollard was on hand to receive the awards last week at the annual Academy of Chocolate awards ceremony on May 18, 2011, at Fortnum & Mason, Piccadilly, London, England. Is it any wonder we favor Amano Chocolate for our recipes? Heirloom is showcasing our Amano love in the chocolate creme brulee currently featured at Communal and our Amano chocolate cheesecake at Pizzeria 712 which features a salted chocolate shortbread crust and is topped off with Amano chocolate sauce and cocoa nibs. Congratulations Art Pollard and team at Amano! Be sure to stop by the Amano factory and storefront in Orem for a tasting of their amazing chocolates and to congratulate them in person. More Springtime Freshness a la Heirloom at Communal! Check out this beautiful springtime creation currently featured on the Communal lunch and dinner menus. This salad of new potatoes, red and golden beets, asparagus and radish is lightly finished with vinaigrette. Beautiful! Please join us soon for your dose of spring! Communal Welcomes New Eateries to Downtown Provo! All kinds of things are happening in Historic Downtown Provo … the Utah Valley Convention Center is well underway and the NuSkin expansion project just started — and on the eatery front, we’d like to welcome some new friends too! Looking north from the corner of Center Street and University Avenue towards Communal. We're thrilled to be part of what's happening in Downtown Provo and would like to welcome all the new, locally owned and operated eateries! Photo courtesy of Provo City's Flicker account. All these friends are within blocks of Communal! 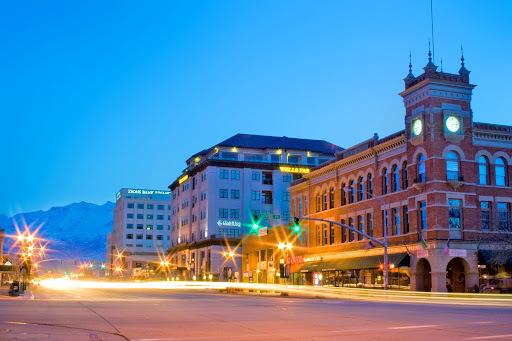 Downtown Provo is certainly THE place for locally owned and operated eateries. We hope to see you Downtown soon! Last Thursday the Catering Co. had the pleasure of catering a private art event held at the Zions Bank Financial Center in Historic Downtown Provo. Three hundred guests enjoyed great art, soothing music, amazing food and beautiful views from the 5th floor. We really enjoyed working with the great team at Zions Bank to put on such a cool event. Don’t hesitate to contact the Catering Co. to help make your event a great success too!